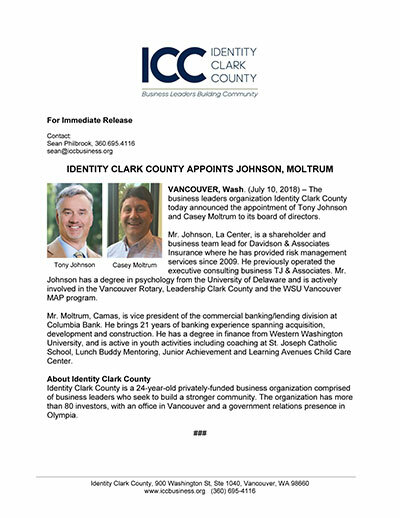 The business leaders organization Identity Clark County today announced the appointment of Tony Johnson and Casey Moltrum to its board of directors. Mr. Johnson, La Center, is a shareholder and business team lead for Davidson & Associates Insurance where he has provided risk management services since 2009. He previously operated the executive consulting business TJ & Associates. Mr. Johnson has a degree in psychology from the University of Delaware and is actively involved in the Vancouver Rotary, Leadership Clark County and the WSU Vancouver MAP program. Mr. Moltrum, Camas, is vice president of the commercial banking/lending division at Columbia Bank. He brings 21 years of banking experience spanning acquisition, development and construction. He has a degree in finance from Western Washington University, and is active in youth activities including coaching at St. Joseph Catholic School, Lunch Buddy Mentoring, Junior Achievement and Learning Avenues Child Care Center.